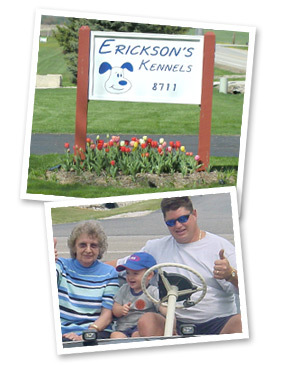 Jack and Maryanne Erickson opened Erickson's Kennels in 1985. The business is still Family Owned and operated by Neal Erickson and his wife Brenda. We believe that our pets are part of the family, and you can trust that you are bringing "your kids" to a GREAT place! The original kennel was completed in 1985 and consists of 38 individual runs. Each run is 18’ long(54 square feet) and is separated by a guillotine door which allows your Pet to have free movement in or out. A number of the Kennels are double in size and accommodate multiple pet families. New flooring was upgraded in 2005. The second kennel was completed in 1988 and is a scaled down version of the original. This kennel accommodates smaller dogs in a 38 square foot run. In both kennels each run is divided by a 36” high fiberglass panel which eliminates fighting and leg lifting. The buildings were designed so that all runs are under roof and are completely enclosed by fiber glass. Wastes are diverted into a specially designed septic system. The Kennels are heated and air conditioned with a maintained temperature of 68 degrees. All exits have gated area for added security. The kennels are cleaned everyday with the assistance of a pressure washer, and waste is picked up all throughout each day. If there are any messes that need tending to, the kennel will be cleaned and the pet will get a bath. It is Erickson’s Kennels Policy that a dog is NEVER smelling or dirty while it stays with us. Cats are housed in a separate area and provided with a spacious pen in our Cat room, or there is an optional bay window with views of the front yard or the back flower gardens. Cattery and litter box’s are cleaned immediately. Other Pets are also welcome: Birds, guinea pigs, rabbits, etc. "I will never go anywhere else!" We love how our schnauzer looks and smells after getting groomed. But more important, Luke is excited and happy and very comfortable at every appointment. "I'm confident my bulldog will get what he needs while I'm away." Anytime I have to leave town on business, I'm assured that Erickson's will provide the best care for Winston. Content copyright 2009-2019. Erickson's Kennels Inc. All rights reserved.